Knoxville is located in Knox County, TN. It is Tennessee's third largest city with over 185,000 people. Knoxville has a humid, subtropical climate. This means summers are hot and winters are rather cool. The area does get the occasional snow fall as well. 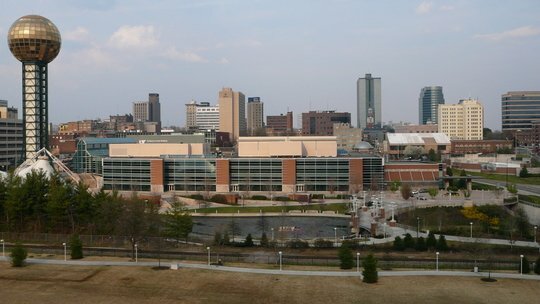 Knoxville is home to the main campus of the University of Tennessee. If you wondering about the economy and job prospects then don't fret as there is a large manufacturing industry and of course the retail and hospitality industries are booming. With a rich cultural environment and a growing city, Kansas City is the place where everyone wants to be. When looking for an apartment in Knoxville be very specific about where you want to live and apply early. Knoxville is a large town so if you have the ability then working with a local realtor would be ideal. However it's advisable that you look at a few apartments before deciding on one. This allows you to compare amenities, prices and more. Apply for an apartment as early as you can. While there is generally plenty of apartment vacancies at various times, if you want to live in a specific community you may not be so lucky. So applying as far ahead as you can is advised. Certain locations may have more competition than others. Knoxville is a large city and so having your own transportation is advised. Some locations close to your apartment may be within walking distance but a lot of things to see and do won't be. So having a car is golden in this town. For those that don't have their own vehicle, the City of Knoxville has the KatBus public transportation system. You can check out their schedules and fees at www.katbus.com. The landscape alone in the Knoxville and surrounding area lends itself to a host of outdoor adventures; from hiking and biking to ziplining and fishing. In addition there are numerous retail outlets for shopping as well as what feels like a million places to eat. Come and check out the local art scene and look for endless amounts of live entertainment throughout the town. The University of Tennessee is a clear jewel amidst all the great things to see in Knoxville. The history of the college stretches as far back as the late 18th century, and the history of the campus along makes it worth touring. If you're new to town, the best way to learn about your new home is to head to the East Tennessee History Center to learn about Knoxville, and the rest of the state. If you want to learn about the history that stretches back much further than the arrival of the European Settlers, then you need to visit the Great Smoky Mountains Heritage Center. This facility does a wonderful job of portraying the life and traditions of the Native Americans who lived in the area for thousands of years before the arrival of the Europeans. Knoxville has a lot of hip, cool restaurants that are aimed at the younger crowd. The Tomato Head is a great example, serving very good pizza in a very cool restaurant. If you want an absolutely first class meal in a slightly more casual and comfortable setting, then you need to go to Connors Steak and Seafood. It offers absolutely top-notch meals but in a more relaxed environment than some high-end steakhouses. Of course, like every city in the south you will find your share of great barbecue joints in Knoxville. Archers BBQ is a staple of the area. 5 Bar is really cool, because with only 5 menu options in each category, you never get overwhelmed. The Preservation Pub is definitely one of the best places in town. This two-floor establishment has live music on a regular basis, and a rooftop deck that is always a happening place to be during the summer time. Sapphire is a great place for people who like an ultra-modern vibe in their drinking establishments. If you like your bars laid back and country music instead, then head to Cotton Eyed Joe. Finally, Boyd’s Jig & Reel should be a required stop for anyone who loves scotch, as their selection of more than 300 varieties is sure to surprise even the most seasoned scotch lover. The Beck Center is a wonderful organization that collects and curates exhibits celebrating the achievements of the African American population. The Knoxville Museum of Art is a truly impressive institution. More than 53,000 square feet are dedicated to five different galleries. To get a glimpse into historic life in the region, visit the Museum of Appalachia. If you enjoy the big, Broadway musicals, then you should pay a visit to the Tennessee Theatre, which hosts a series of “Broadway at the Tennessee” each year. Classical music fans should enjoy the performances of the Knoxville Symphony Orchestra. The KSO does a great deal of work with youth and schools in the area in addition to their regular series of concerts. John Sevier Days is a unique, week-long event that features demonstrations of what life was like one and two hundred years ago in the southern United States. There is a strong contingent of car lovers in Knoxville who love coming out for the annual Auto Show each April. Fireworks lovers never miss coming out for Boomsday in September, which features one of the most impressive fireworks displays in the country. October brings the Tennessee Fall Homecoming to town. This is a large festival that brings together more than 300 musicians at the Museum of Appalachia, as well as craftsmen from many different creative disciplines. The largest mall in the Knoxville area is the West Town Mall. This is the largest mall in the area, and is anchored by stores like Belk, Dillard’s, Sears, and JC Penney. For those who enjoy the indoor mall experience, it doesn't get much better than the West Town Mall in the Knoxville area. There are many areas throughout the city that provide great street shopping featuring independent shops as well. The Bearden District is one very good location to try. The Southern Market is also a wonderful place to browse, comprised of more than 40 distinct little shops. You can find the Southern Market on Homberg Dr. The University of Tennessee Volunteers are members of the Division I SEC, often considered to be one of the best conferences in college football. Attending a Vols football game is something that almost everyone in Knoxville has done at some point in his or her life. Vols football is a tradition that goes back more than 125 years, with the team playing it's first games in 1891. The program has produced a number of players who have gone on to exceptional NFL careers, but perhaps none more impressive than Peyton Manning, arguably one of the greatest quarterbacks to ever play the game. One of the most appealing things about Knoxville to many people is the Urban Wilderness contained within the city. This area covers more than 1000 acres just off the water, and is in many ways the most distinctive feature of Knoxville. There are historic sites, individual parks, and recreational opportunities contained within the Wilderness, not to mention more than 40 miles worth of trails. The historic sites include three forts dating back to the Civil war. You can rent canoes and bikes if you don't have your own, so anyone can enjoy this truly remarkable opportunity for outdoor recreation.